Last week, one of the projects that I’ve been working on during my “sabbatical” came to fruition when the Open Knowledge Festival took place in Berlin. I was one of the three main organisers of the event, which has been a fantastic experience involving plenty of learning and sharing. I really enjoyed the opportunity to work with such a vibrant “community of communities” interested in creating a future where key information is made more freely available and used to improve society as a whole. 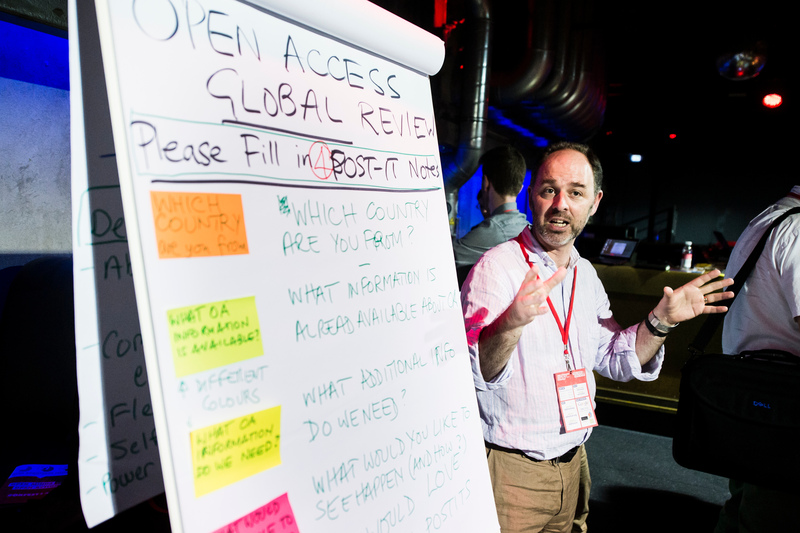 The theme of the festival was “Open Minds to Open Action” which meant an emphasis on taking the increasing interest in opening up public data, and identifying how we could convert that into useful ongoing projects, relationships and knowledge. This resulted in a highly productive event – with many sessions, projects and impromptu campaigns crammed into the 2.5 days of the festival (See the 83 etherpads of online notes for a taster of some of what went on, and all the other material that was produced listed here). 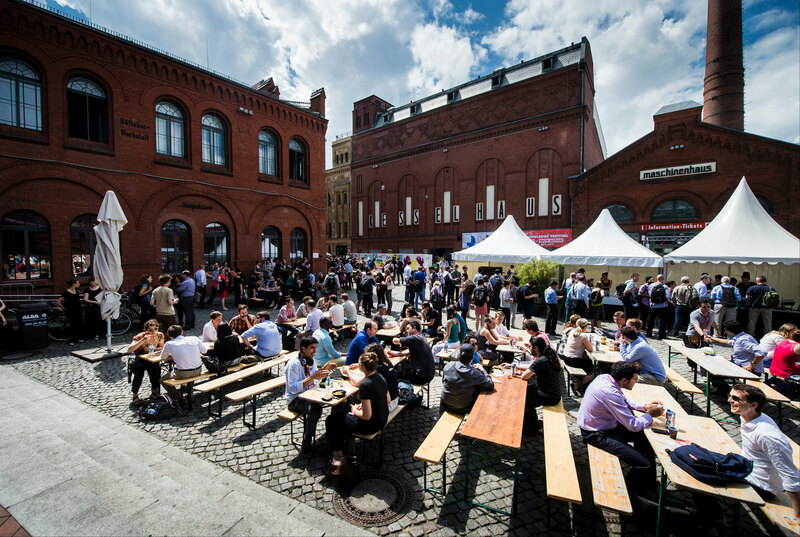 Another highlight for me was the energising atmosphere all around the Kulturbrauerei venue – a former brewery complex where over 1000 participants came together. The buzz at the event has prompted me to reflect on the importance of these flagship annual events to bring together people from distinct projects and communities, who mainly connect online during the rest of the year, or perhaps don’t connect at all with those outside their own community. I’ve identified 7 factors that in-person events of this type provide, but if you think I’ve missed any, or have additional examples based on events that you’ve been involved with, please do mention them in the comments. 1. Ability to scale The festival was HUGE – with over 1000 attendees and multiple sessions taking place at any one time, there was a lot of ground covered in a short space of time. It would have been impossible to coordinate such a large gathering of people online. 2. Connecting a global community One of the things that sets OKFestival apart from any of the other events that I’ve been involved with organising is that it really does bring together people from all around the world. Diversity was a key motto for the organisers and thanks to the help of a sizeable Financial Aid programme the festival welcomed attendees from over 50 countries, including South American and African participants. For all the wonders of online tools, there’s simply no way that this many time zones could have been crossed so successfully in an online-only way. So it’s not just that the meeting was big – it was global too. 3. Facilitating sharing and serendipitous connections OKFestival brought together people with similar ideologies – to make information more accessible and to use it for good – but many of them work in different sectors. These ranged from science to education, development to financial transparency. Scaling up from individual smaller communities by bringing them all together as a larger “community of communities” enabled sharing to take place between the different groups. Given many groups may be facing similar challenges, facilitating information exchange may make finding solutions more efficient. 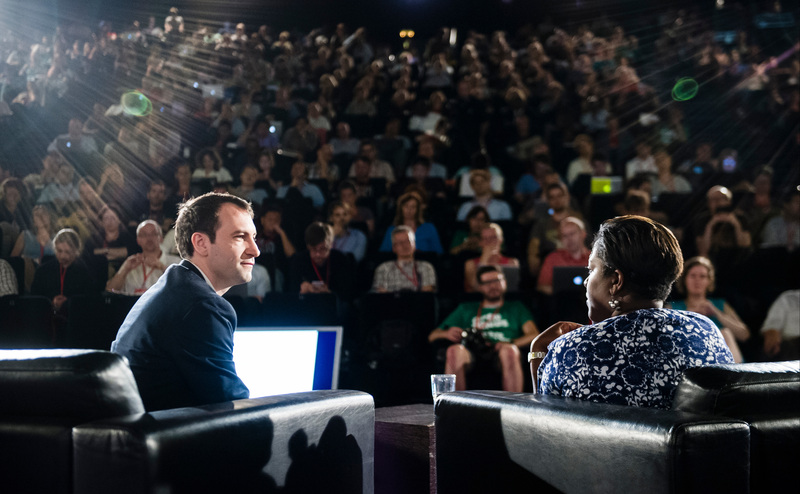 While the sessions were intended to mix people with overlapping expertise together, much sharing also happens outside of the official programme, where a serendipitous conversation over coffee might spark a new connection or collaboration. Mixing together so many people with related interested who may not usually have the opportunity to meet in the same place increases the likelihood of this happening. 4. Relationship building Meeting someone face to face helps to deepen your relationship in terms of building trust and understanding (and a better appreciation of their quirky sense of humour that may have been less obvious online!). When you do this at scale, that’s a lot of goodwill being generated that can then help sustain projects and partnerships in the future. 5. Getting things done Remote working – and connecting – with others can have its advantages in terms of work-life balance and allowing you to choose your preferred location, but it may also be less productive. An increasing number of people live in cities because having everything (and everyone!) in close proximity allows us to get more done. So too with meeting face-to-face at an event like this. This benefit of face-to-face working was true for the three organisers too. We all live in different cities, but really benefited from the handful of occasions when we got together for a couple of days to push hard to reach key milestones for the project. 6. Shared attention – Meeting face to face isn’t only good for building trust and understanding, and getting things done. Having shared experiences to reference back to is also important for a sense of community spirit. So, a successful event programme needs more than sessions where people work together to do things in small groups. 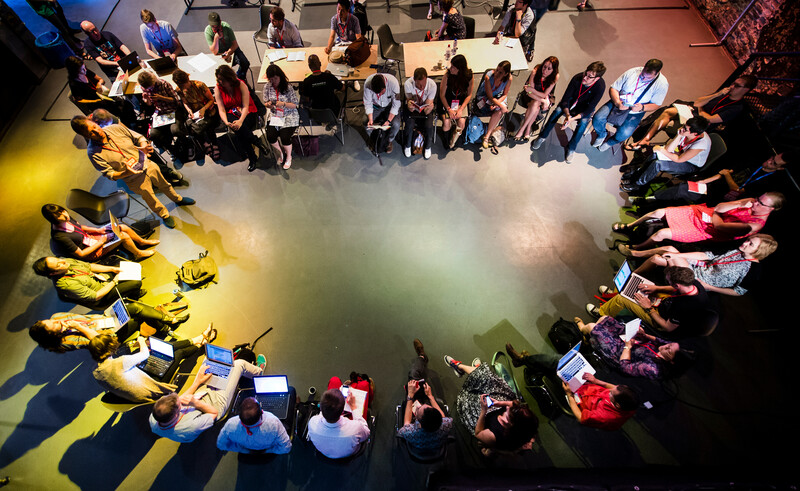 It also benefits from opportunities to sit together as a large group and put collective attention onto the same thing.The keynotes each morning at the festival were designed to do just that. It can be inspiring to hear a case study of a project that has seen success – as Patrick Alley showed with Global Witness’ work on anti-corruption. And it can be thought-provoking to hear about what challenges may lie ahead, as Eric Hysen of Google showed in his discussions of the need for better shared infrastructure to reap the benefits of technology-focused projects. Sharing these types of experiences can build a sense of community identity among attendees and also spark conversations and generate momentum for the other activities at the event. 7. It’s fun! And finally, for those of us that spend large chunks of our working lives online, it’s important to be able to have some more sociable “downtime” spent in person with our colleagues. The lack of watercooler chat that working remotely can bring – with no easy opportunity to pop out and get a coffee together – means that when you do meet face to face, there’s a lot of catching up to do. And what better place than a former brewery to work really hard together for a few days, and then to share a celebratory beer and slice of cake in the sun afterwards? 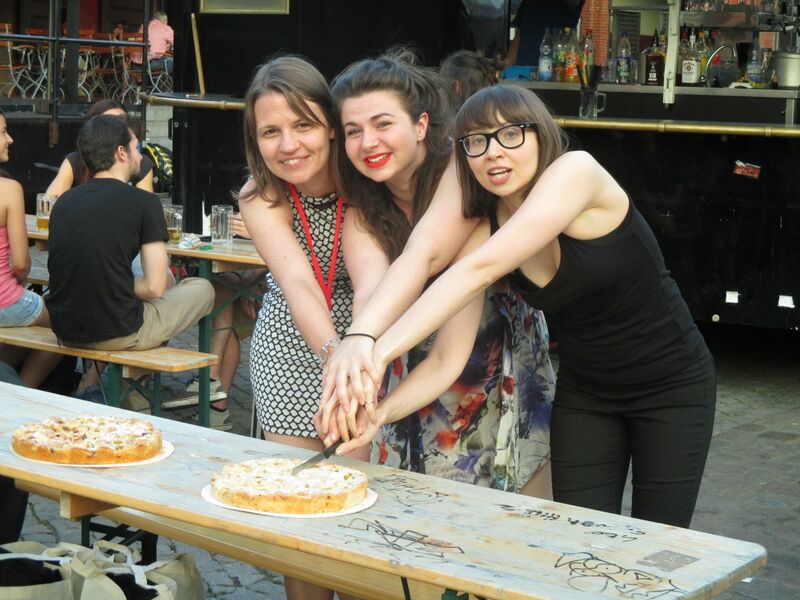 The Open Knowledge Festival core team (left to right – Lou Woodley, Megan McGrattan and Beatrice Martini). Photo by Marieke Guy. This entry was posted in Events, Online Communities and tagged #okfest. Bookmark the permalink. Thanks for this! I’ve always felt intuitively that we can’t just have EVERYTHING happen online, but can’t always explain why not. I’d come up with 3, 4, and 7 on my own, but not your other points (at least not to the extent of being able to summarize them in a short sentence).